As the 4th of July approaches, it seems fitting to reflect on the traditions of this country and its people. Of course it’s appropriate to think about things like freedom, fireworks and Will Smith, but what we really embrace on the 4th of July is eating and drinking. One of my favorite aspects of the American food culture is brunch. A truly American brunch consists of large portions of food often served with a liquid “appetizer” (sometimes a mimosa, but in my case, the bloody mary). Using that as my working definition, I couldn't find a brunch more fitting, patriotic or American than the brunch at Hash House A Go Go. This small chain restaurant prides itself on utilizing their “experience with farm fresh agriculture, livestock, and old recipes with a twist.” And it’s the perfect stop for an all American brunch. Let’s start with the food. After being seated at the bar with The Drunken Tomato, I started to peruse the large menu, full of what looked to be a quite diverse and appealing list of entree options. As I scrolled down the menu, my eyes locked onto one particular item. I promptly stopped reading, set my menu down, took a deep breath and waited impatiently to order. This special item was the Sage Fried Chicken and Waffles with a maple reduction, fried leeks and bacon cooked into the waffle. That’s right, bacon cooked INTO the waffle. It was literally a bacon waffle fried chicken Tower of Babel with a rosemary stalk reaching out to the brunch gods. The bacon waffles with maple reduction were wonderful. The fried leeks were incredible. Unfortunately, the fried chicken was somewhat lacking in seasoning, in my opinion, but all in all, a good time was had by all (me, my mouth and my belly). Consider my belly busted by the end of the meal. Now to the “meat” of the matter: the bloody mary! 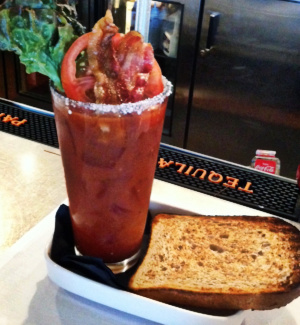 I have enjoyed a few BLT bloodys in my time but, you guys! this was like literally a BLT (please forgive my valley girl language, but I was just like totally excited for this drink). Let’s break this down. Bacon? Check. Lettuce? Check. Tomato? Check for both the juice and the garnish. It was even served with a slice of some quite tasty toast. The presentation alone showed that this was going to be a serious drink. Upon first sip, it was evident that some diligent effort had been taken in constructing this bloody. The jalapeño infused bacon had the sweet smokiness of bacon accompanied by a nice jalapeño kick, but what I appreciated most about the bacon was that it was folded in half, leaving the majority of the bacon outside of the tomato juice to prevent any sogginess; a brilliant move not always taken. The vodka was pleasingly prevalent and the tomato juice was spicy without being overly reliant on horseradish. Overall, the drink was full bodied and felt very complete. So, if you’re looking to embrace the great American brunch, look no further than drinking a bloody mary, through a very American (read: very large) straw, at Hash House A Go Go. 4.5 Celery Stalks. Post Script: Being that we are equal opportunity alcohol consumers here at the Drunken Tomato, it is worth mentioning one other boozy brunch offering. Possibly the most patriotic item on the menu, the O'Hare of the dog consists of a 24 oz Budweiser served in a brown paper bag and a side of bacon. Now, that’s a Sunday Morning fit for a true American. Happy 4th of July! Hash House A Go Go. 6800 West Sahara Avenue Las Vegas, Nevada 89146. T: (702) 804-4646. Additional locations in Las Vegas, San Diego and Chicago.